August 2012 ~ I Can Do That! For Food Friday this weekend, there is no cooking involved which is just perfect to enjoy the last few weeks of summer. Have you tried frozen seedless grapes? These tiny champagne grapecicles are a great frozen treat without much work to be done except washing them, then freezing for 2 hours. 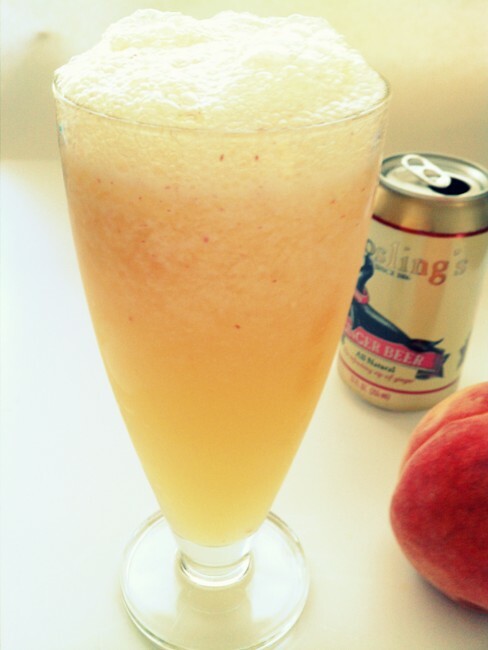 This is my non-alcoholic version of Bellini, a refreshing drink made with white peach juice and Prosecco. 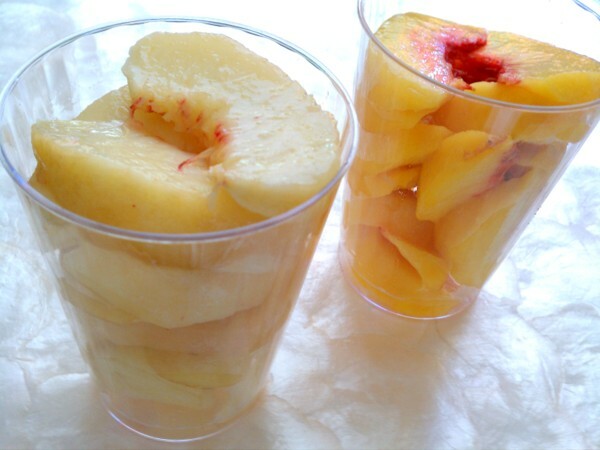 I pureed the fruit with a little sugar and added crushed ice, seltzer water, and ginger beer. I also mixed some of the puree with just seltzer water for a stronger peach flavor but I like the one with ginger beer more. 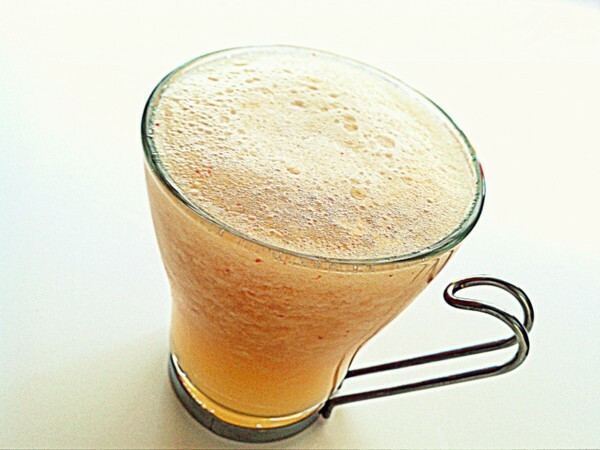 You may substitute frozen puree or bottled juice for the fresh fruit puree. Peel peaches, remove stones and discard; dice peaches and puree with the sugar. Divide puree between 2 tall glasses. Stir in ½ cup ice into puree. Pour ½ cup each seltzer water and ginger beer. Stir gently with a metal stirrer. The vendor at the farmer's market was so generous, he gave me 3 extra white corn cobs; 15 in all for $3.00. I already boiled and ate more than my share of corn and decided to make cream-style with 5 pieces. These white corn are super sweet, starchier too, and sticky just the way I like it. Chocolate-filled croissants and toast with chocolate spread are my favorites for breakfast and thought for a change why not fill sweet dough with chocolate candy. I thought dark Toblerone would be great to fill the sweet buns. They came out so soft, not too sweet, and are perfect with the slightly bittersweet chocolate. I made the buns a little thicker because I want more bread than chocolate. I can have these every day for breakfast with my milky espresso. In the mixing bowl of a standing mixer, whisk together 2 cups of the flour, yeast, dry milk, and sugar. Add hot water and with dough hook attachment, mix on low speed for 1 minute. Increase speed to low-medium, add eggs one at a time, then the remaining flour, ½ cup at a time, beating well after each addition. Add salt and beat for 1 minute more. Increase speed to medium high and continue mixing, adding butter, 1 tablespoon at a time, until each butter addition is absorbed. Dough will be soft and sticky. Knead until dough is elastic, shiny, and comes off the sides of the bowl, about 10 minutes. Transfer dough into a container, cover with plastic wrap and leave on the kitchen counter until doubled in size, about 2 hours. Refrigerate dough for at least 2 hours until well-chilled. Divide bars into sections; set aside. Remove dough from refrigerator and divide into 3 portions. Refrigerate 2 portions while shaping the first one. Flatten dougn into a 24 inch x 5 inch rectangle. Place 12 Toblerone triangles 1¼ inches apart along the lower half of the dough rectangle. Fold the other half over the chocolate and pinch the dough edges on 3 sides. Gently press in between chocolate triangles and cut at an angle with a sharp knife. Place pieces 2 inches apart on a cookie sheet. Repeat with the remaining dough portions. Cover with plastic wrap and let rise for 1 hour. Brush tops of buns with egg wash and bake for 25 minutes until buns are golden. Do you like canned pork and beans? I do. I love the tender beans and the salty sweet sauce with toast for breakfast or lunch. I cooked pork and beans once before using the slow-baked Boston Beans method. It takes long to cook but it's all worth the wait. This time I used black beans, chunks of salt pork, and a little maple syrup. I love it! Boil dried beans in 3 cups water in a Dutch oven. Lower heat, cover, and let simmer for 2 hours. 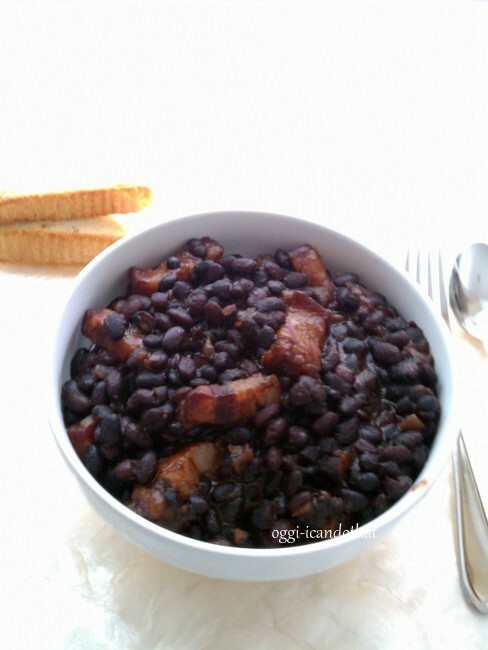 Stir in the rest of the ingredients, cover, and bake in a 275 degree F oven for 6 hours or until beans are very tender. During baking, check if additional water is needed. Serve hot with toast or crusty bread. 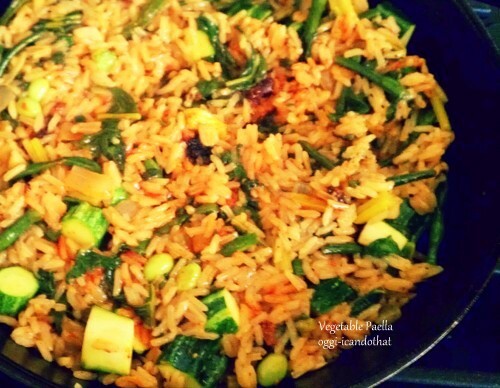 One of my favorite paella recipes is Jose Andres's Vegetable Paella which I make regularly. Here's my latest version with random vegetables from my garden: long beans (sitaw), edamame, rainbow Swiss chard, baby zucchini and blossoms, and tomatoes. It's delicious! Heat oil in a medium paellera or cast iron skillet. Add onion and garlic and cook until onion is soft. Add the vegetables and stir fry for 2 minutes. Add salt and rice; saute for 2 minutes then add sofrito. Stir cook for 1 more minute. Add broth and saffron. Let come to a boil, lower heat and let cook uncovered for 25 minutes. Serve hot with boiled eggs and sliced lemons, if desired. Our August 2012 KCC hosts Kai and Isabel challenged us to prepare dishes that are healthy and nutritious, dishes for longevity, pampahaba ng buhay in Tagalog, or dishes that are believed to have restorative or curing power like tinola and cerveza negra specifically for nursing moms.